No insect can more effectively dismantle and destroy a home than termites. They are an invasive and nearly indestructible insect infestation that will do more damage the longer they aren’t dealt with. If you have a termite problem, then you need to purchase some termite bait stations as soon as possible. Which Bait Station Should You Choose? Spectracide Terminate Termite Detection & Killing Stakes are the best overall termite bait station because it simultaneously detects and kills termites quickly and effectively. Termites rarely if ever appear on the surface of what they are eating and infesting. So it can be very difficult to know whether your home has been overrun. 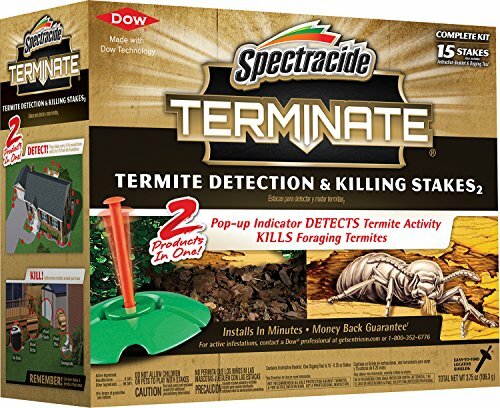 The Spectracide Terminate Termite Detection & Killing Stakes kit makes it easy to determine whether you have termites and immediately take action. Simply place the stakes around the perimeter of your home per the labeled instructions. As termites take the bait a red stake is triggered, so you know exactly where to concentrate your exterminating efforts. Spectracide Terminate Termite Detection & Killing Stakes installs in minutes and can achieve full yard coverage with only 10-20 stakes depending on the size of your yard. Though Spectracide Terminate Termite Detection & Killing Stakes is effective against termite infestations, it is not recommended as your homes sole protection against termites. Termites don’t only infest large homes. They are just as much of a nuisance for small homes too which is why the refill version of the Spectracide Terminate Termite Detection & Killing Stakes is the perfect size for smaller termite infested homes. The standard size Spectracide Terminate Termite Detection & Killing Stakes include 15 stakes that have a range of 1200 square feet, which may be too much coverage for smaller homes like rustic cabins or antique cottages that are often plagued with hungry termites. Smaller homes like cabins and cottages are primarily constructed from wood which makes them dinner for termites who forage in mud tunnels along the foundation of the house and eventually inside. 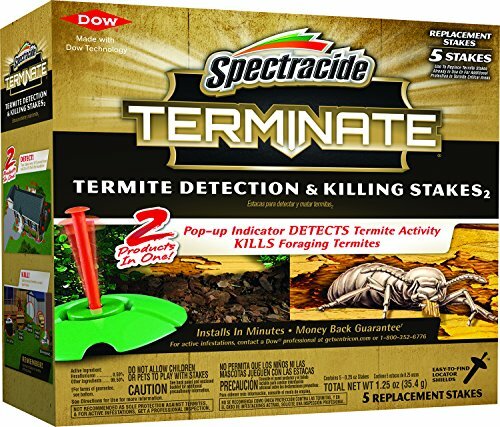 The refill size of Spectracide Terminate Termite Detection & Killing Stakes includes 5 stakes, allowing for a smaller coverage area and a more affordable alternative to buying 15. Termites are stubborn little insects that can reduce the value of a home faster than they can reduce wooden walls to sawdust. If you care about the value of your home, then you need to eliminate the termite infestation as fast as possible. Exterminators can be very expensive, and you may need to hire one for more than one job, depending on the size of the infestation plaguing your home may. An alternative to an expensive exterminator is the Advance Termite Bait Stations. The Advance Termite Bait Stations is designed to be encased in your yard and loaded with irresistible wood bait. The bait attracts the termites who cluster inside the trap. Once the traps have attracted the termites the bait is replaced with a cylinder of poison tablets which the termites then take back to their nest, thus exterminating the entire infestation. Regardless of the size of the termite infestation, most termite bait stations will still recommend that a professional exterminator is hired to finish the job. Ultimately the termite bait station that you choose will be determined by the size of your home and the extent of the termite infestation. For homes and infestations ranging from small to medium then the ideal termite bait station would be either size of Spectracide Terminate Termite Detection & Killing Stakes. For larger homes and termite infestations the obvious choice is a professional grade bait station. No other bait station will be able to provide both maximum yard coverage and provide the extermination power of a professional-grade termite bait station. Utilizing termite detection stakes is an easy and effective way to determine the extent of a termite infestation and discover the source. When used in conjunction with chemical sprays, poisonous bait and professional extermination services the termite detection stakes turn a tedious, frustrating job into a simple task of pointing out the red detection stakes. Combination detection stakes and lethal termite bait like the Spectracide Terminate Termite Detection & Killing Stakes featured here is an affordable and effective way to ensure that termites are destroyed as easily as they are detected. When used continually the detection stakes serve as an early warning system for future termite infestations. Simply place them around the perimeter of your home and keep an eye out for any that pop up, indicating a new outbreak of termites. Lastly, should a termite infestation ever grow out of hand and require professional extermination the stakes enable you to skip a costly assessment and hours of labor costs. The exterminator will be able to identify the areas infested with termites and quickly exterminate them. The standard termite bait station typically includes a two-step process. The first step is to load the bait station with bait and wait for the termites to be attracted to the bait and enter the station. The second step typically involves removing the bait and replacing it with a termite poison which the termites are allowed to carry back to their nest. 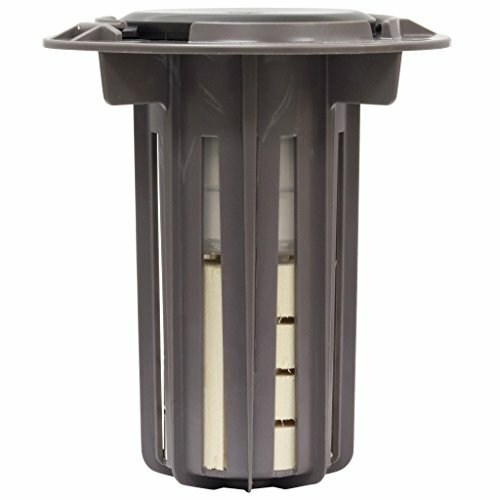 When choosing between termite bait stations, it’s essential to consider their effective range and how many of them you will need to purchase to provide maximum coverage for your home and yard. It’s also important to consider the effect the use of poisons and chemical agents on your yard will have on the yard and those who play in it, primarily children and pets. If children and pets often play in the yard the better alternative to toxic termite poison may be a natural, environmental and child-friendly termite poison. Termite infestations can be extensive, and there can be more than one nest per outbreak. In the case of severe termite infestations, the most effective solution is a professional grade termite bait station that is equipped to handle larger infestations. Professional grade termite bait stations enable you to cover larger areas of your home and yard with more powerful, extremely potent protection from termites, and possibly even destroy the termite nest in its entirety. Regardless of the size of the termite infestation, most termite bait stations will still recommend that a professional exterminator is hired to finish the job. However, skipping directly to the professional grade termite bait station may enable you to skip the exterminator all together, which will save you time, frustration and most importantly your hard-earned money.